I am excited to welcome Fran back to Escape with Dollycas! What do I do and where do I go when I want to escape any sort of humdrum? Not that my life is humdrum at all. I can always find something to intrigue me, amuse me, or inspire me. But there are those times when I want to veg out, and I find myself playing with words. Writers do that sort of thing. A lot. At least, this writer does. Several years ago, for instance, I meant to type the word centimeter, but it came out sentimeter. That made me think about sentiment, sensation, sensible, and so on. At the time I was planning to drive 150 miles to pick up my first beehive. Two Scents Worth: what I enjoy putting into conversations and enjoy hearing from others as well. Feel free to put your two scents’ worth into a comment below! Nectar-grination: flying all around the place to find some flowers that have enough nectar to be interesting. Queenification: the process of eliminating a weak queen and producing a new one. Beebreadify: To bring bee bread (a rich mixture of pollen and various liquids) down from the storage cells and feed it to the baby bees. Cleansi-depoopifi-dumpification: Taking the queen’s waste products away from her and depositing them outside the hive. Scrubba-dubba-da-deck: What Frannie will have to do next summer after a lot of cleansidepoopifidumpification has been going on. I ended up using some of the words in both of these lists in the beekeeping blog I wrote for a couple of years, so if you’ve seen them before, please understand I thought they were too good not to be recycled. In the meantime, I continue to play with words every chance I get. Thank you Fran for dropping by today! Hamelin is overflowing with tourists enjoying the Scottish-themed games—and most of them are donning tartans from Peggy Winn’s ScotShop. And her fourteenth-century ghostly companion, Dirk, has been indispensable, keeping an eye out for shoplifters and matching customers’ family names to their clan plaid. Adding to the chaos is Big Willie, a longtime champion of the games, but not everyone is happy to have him in town. So when he misses the first event of the weekend, Peggy senses something is awry. After Willie is discovered dead in his hotel room, the victim of a bagpipe-related crime, Peggy decides it’s up to her and Dirk to suss out a murderer. Nothing puts a damper on a festival quicker that a murder especially when it is a long time champion of the Hamelin Highland Festival that is found dead in his hotel room. Peggy was just getting to know the man and finding his body was so traumatic. She starts her own investigation with her handsome ghost’s assistance. To add to the excitement the town in crawling with Secret Service. It appears the President wants drop in for a visit. This story has a slow build as we get to know some new characters, especially Big Willie, the former champion who is killed and his Scottie Silla. Big Willie’s body is found about halfway into the story and the pace picks up considerably. There are two plots that converge along with another subplot to keep us turning those pages. Ms. Stewart brings humor to this story with Peggy still explaining current time expressions and things to Dirk as he struggles with the ways of modern times. She does trust him more to go off by himself and they are learning to work together. She keeps his speech and its patterns true to his Scottish 14th century time. This was a bit frustrating for me in the first book but now it is natural for me to read. I can even hear the lilt in his voice. The author also tells a bit of the story from Scottie Silla’s point of view. Touched my heart as a pet mourned the lost of her companion. As always the majority of the story takes place in or close by to out protag’s ScotShop. I can picture the store very clearly in my mind. Peggy also has a tent selling ties and scarves at the festival. I need to give a little shout out to Jessie Reisch for the amazing cover art for this book. 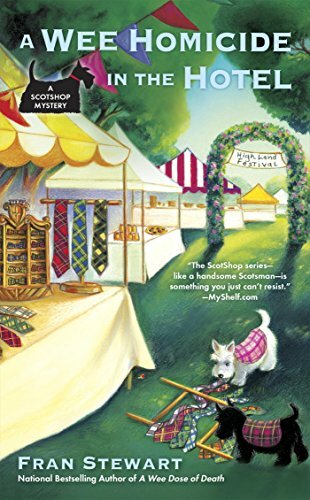 Those two adorable Scotties with the festival grounds take me right into the story. These characters have warmed my heart. Cozy lovers will love Peggy and Dirk. I suggest reading the series in order though so you don’t miss a minute. Fran is the author of fourteen books, including the Biscuit McKee mystery series and the ScotShop mysteries , as well as A SLAYING SONG TONIGHT and FROM THE TIP OF MY PEN : a workbook for writers. When she isn’t writing or otherwise playing/working with words, she loves to read, sing, knit, garden, put jigsaw puzzles together, and volunteer in her grandchildren’s school library. 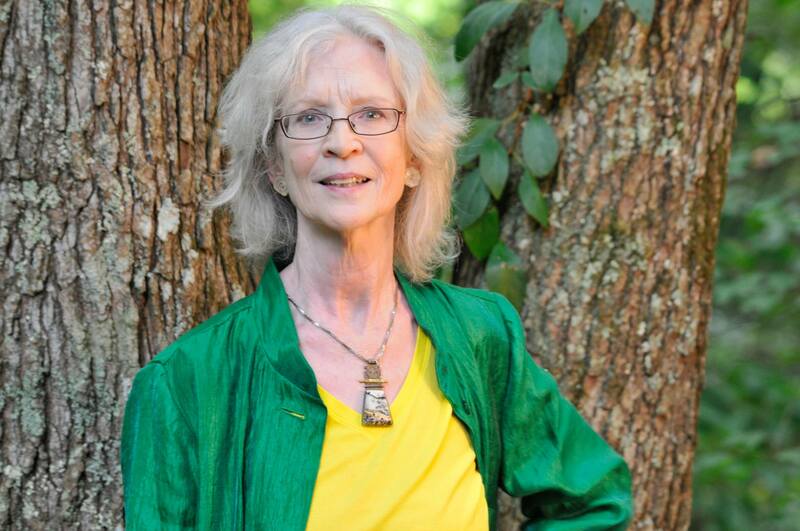 She lives and writes quietly beside a creek on the other side of Hog Mountain, Georgia, after having moved repeatedly from her birth through her fourth decade. The small fictional towns she writes about embody the hometown she always wanted—except for the murders. To find out more about Fran Stewart and her books on her webpage here. Leave A Comment for Fran Stewart for 5 Bonus Entries. I’m so glad you enjoy my books, Linda May. Thank you! Thank you for the giveaway, this looks like a fun series and wouldn’t be too hard to catch up on! This looks like a fun read–thanks for sharing! This sounds like a really good series! I will have to check it out! This book looks delightful and very special. Love this series. I’m so glad you enjoy my ScotShop books, Sharon. This third book is definitely my favorite of the three. A new to me series, thanks for bringing it to my attention. I love this series & it was fun learning more about you & your bees. Those morning cups of tea beside the hives were a favorite time of day for me. If you check out my beekeeping blog, there will be a lot more to learn! I was an English Education major and always found word origins interesting – so I found this article fun! Thanks for the giveaway. Adding this to my must read list. Another series to add to my TBR list! I met you when you published Orange as Marmalade. I would love to try your new series. Lovely to hear from you, Elaine. ORANGE was quite a while ago. Now there are seven books in that series and three in this one. Would enjoy being you again. This does sound like a fun read. Love anything Scottish! Looking forward to reading! This is a new series to me. Sounds like a really fun read. Looking forward to reading the series. Loved those words! Thank you! What a fun post, all the uses for scent! Looks like a good book. Thanks for the chance to win. Glad you enjoyed it, Sally. I enjoy spreading the word fun around. It’s always nice to find a new author (to me) that’s so intriguing! Thanks, Karen. I love being intriguing! I’ll be adding this series to my list! Fran Stewart, you book looks absolutely wonderful. Thanks for the fun. You’re most welcome, Sharon. If I can’t spread a little joy here and there, what good is life? That’s what I’ve always tried to do in my books (even though there has to be a murder here and there). What a fun sounding series. this great review has my interest up!! I hope you’ll enjoy the book as well! Everytime I see one of these books I am reminded of a school friend who was Scottish and just loved everything associated with her heritage. Thanks for the contest—and the memories. I know how she feels, because I feel much the same way. I thoroughly enjoy wearing my Stewart ancient hunting tartan to book signings, book clubs, and anywhere else I can think of an excuse to wear it. Visiting Scotland (the two times I’ve been there) felt like a home-coming. I enjoyed the haggis, the music, the highland scenery, and I cried as I stood before the Stewart stone at Culloden. This looks like such a fun series! Thank you for the giveaway opportunity! I’d like to visit this scottish-themed shop. It sounds so cute.